One of the most important responsibilities of a leader is to hire the right people for the right positions. By utilizing highly accurate analytics, we can improve your “fit” rate from 33% (current research) to 90+%. By transferring the knowledge and tools to your team, you can accelerate the integration and productivity of your team. 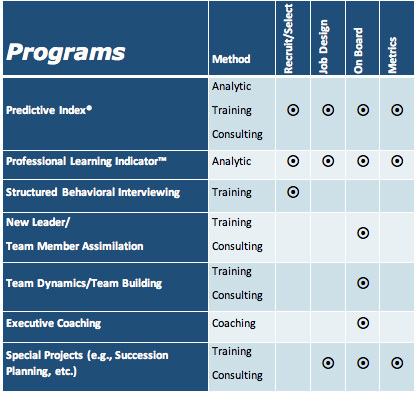 Gain an accurate understanding of candidates by using structured behavioral interviewing techniques that produce the information you need to make the best decision. By leveraging the Predictive Index results, job description and responsibilities, learn how to develop and ask questions that gain the best understanding of job candidates. 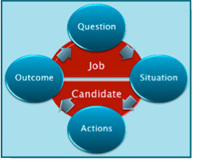 Improve your interviewing skills and select the candidate who has the greatest probability of success. Part of the acquisition process is to assimilate the new person into the team. This is not just about curious personal questions – it is about work styles so that the team doesn’t waste time trying to guess or figure it out for months. As we share the leader and team work styles, they discuss how to work more effectively together and how to deal with any team gaps. Then the team reviews and clarifies team goals, who needs to do what by when, and addresses any confusion. In this way teams accelerate their productivity and their results. The Form – Storm – Norm – Perform cycle is accelerated and results are achieved more quickly!